Mistral is not only a helicopter carrier but command ship equipped with data acquisition, processing and transmission systems essential for landing operations and sea battles. Mostly, these functional capabilities are just what attract some Russian admirals. To execute functions of a fleet command ship, Mistral is furnished with a situation command center which is 850 meters in area and has 150 working places. Plug-and-play principle is applied at operator's positions – there are laptop-compatible wire networks under the deck plate. The center's working areas are separated by easily detachable ground glass division walls (resembling a sort of an office), which makes possible to configure the center's capabilities for certain tasks. Combat direction center, operations center, and communication center are located in adjacent rooms. This gives an integrated picture of outboard situation from all data sources including external ones, and makes possible to control not only naval forces but troops operating ashore (take note that ship-based headquarters needs appropriate reduce in number of landing party). I bet even non-experts understand that foreign warship stuffed with foreign equipment and arms cannot easily match Russian Navy. It is like buying of luxurious Porsche Cayenne for a car base operating reliable old-fashioned trucks. No spare parts, no fuel, no maintenance skills… Finally, what's the point of such car? Only to ferry the car fleet's director around the city? 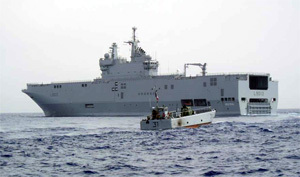 Similar situation is with Mistral. It is not unlikely that some very important epauletted people are keen to buy a kind of a mega yacht which also could be used as a command ship if anything crops up (but this "anything" may not occur at all!). So what will this ship command? Where are those naval forces? Don't tell me that it is necessary to buy a floating headquarters to operate an "invincible armada" consisting of Petr Veliky, Admiral Chabanenko and a pair of escorts. Isn't it more reasonable to target governmental efforts at creation of fleet, but not at buying its separate elements especially as they are not the first-priority needs? All we see now is a sad approach resembling a rich blonde's thoughtway – to match the color of car to the color of her purse. By the way, speaking of "nano issue" so popular at present, isn't it a time to depart from the idea that command ship should be the biggest and the most detectable in the task force? As is well known, a big ship asks for a big torpedo… We all recollect that command ship of Soviet Navy preparing for total war was supposed to be a relatively small-sized but well-armed nuclear submarine with 1-km operating depth and absolutely every communication system one can think of.